Owning a good pair of basketball shoes is a must if you shoot outdoor hoops on a regular basis. There are a lot of traits the best outdoor basketball shoes have that set them apart not only from regular old sneakers, but even indoor basketball shoes as well. These exclusive traits work together to up your performance when playing outside while keeping you safe and preventing injuries that outdoor play can make you vulnerable too. Better still, getting a pair of high quality basketball shoes to use outdoor will also prolong the life of your shoes as well. 1.15 What is the difference between outdoor basketball shoes and indoor basketball shoes? 1.16 What are the benefits of buying outdoor basketball shoes? The Nike Zoom KD 9 Elites have been designed with improved responsiveness in mind. The forefoot and heel cushioning is thicker on these, which not only helps with shock absorption, but it’s great for players who put a lot of pressure on their heels. Meanwhile, the forefoot has thinner cushioning, which ups your control factor during quick moves. The Nike Zoom KD 9 Elites are made with Nike Flyknit, which is designed to have, as Nike puts it, a “sock-like” feel on your feet. This technology helps tremendously not only with the fit, but breathability, which is perfect for playing outdoor basketball in the heat. The multi-directional traction pattern is made out of hard, durable rubber, and is specifically designed for multi-surface play, so it’s going to be an excellent outdoor shoe, while still having that versatility a lot of players prize. The Flyknit uppers are very comfortable and ultra-breathable, so your feet remain nice and cool while you play. The thicker cushion in the heel can definitely be felt, and it’s great for players who wear out the heel of their shoes quicker than the toe. The traction is specifically designed to be multi-surface, but it’s hardness and rigidity makes it especially good as an outdoor basketball shoe. Worthy of note, a lot of people report this shoe fits true to size so it might be easier to find a good fit with this one. While the traction pattern is great for outdoor surfaces in terms of grip and stability, you’re going to want to be sure to keep it clean, because the small spaces between the pattern shapes can collect dust and dirt. That said, maintaining outdoor shoes of any kind is of the utmost importance, as it’ll make your thread last longer, so this isn’t too big of a deal. The Kyrie 3’s superior traction is, arguably, it’s most important feature. The main traction pattern is herringbone, which does really well on outdoor courts. The sole is rubber, providing extra grip and durability during outside play. The combination of these two features results in a shoe that gives you the ability to make quick cuts, enabling fast-paced gameplay. Flywire cables, located in the laces, lend extra stability for ankle support when you’re in the zone. Zoom Air cushioning in the forefoot provides extra comfort without adding bulk to the shoe’s profile, for a sleeker appearance. The Kyrie 3’s are great for fast gameplay, and the herringbone traction pattern gives you a major traction advantage on outdoor courts. The Zoom Air cushioning system located in the forefoot provides control and stability when you make fast cuts, and the mid-top design is a nice balance for a combination of ankle stability, yet while still providing some level of flexibility in the ankle for those who prefer that level of motion on the court. Of special note, a lot of folks say the traction on the Kyrie 3’s are better than the Kyrie 2’s, so, chances are, if you’re a Kyrie 2 fan, you’ll probably really appreciate the overall design of the Kyrie 3’s. Overwhelmingly, most people agree this is a great outdoor shoe. Other guys say no, however. Ultimately, this is going to be more of a preference call, but it’s worth mentioning the mixed opinions here. Also, these shoes are extremely lightweight, so if you prefer a heavier shoe (for whatever reason—no judgment) then this may not be the shoe for you. The Nike Men’s Air Max Infuriate Low Basketball Shoes are a shoe that is rapidly gaining a lot of support from outdoor basketball players. To be blunt, people love this shoe for outdoor play, and it’s easy to see why. The rubber sole is extremely durable, so you’re going to get a lot of life out of these. And while the traction pattern may not be traditional for an outdoor shoe, the variation in patterns on the tread makes for a very grippy feel on an outdoor asphalt court. Additionally, the tread is also more rigid than a lot of the shoes out there, which is another aspect that makes it a good outdoor choice. The mesh upper means your feet can breathe while you play in the summer heat; it also cuts down on the weight of the shoe, providing additional comfort. Phylon midsoles provide a high level of cushioning without loading you down or shortening response time. Meanwhile, the Flywire cable integrated laces keep you locked down and make for a better fit. The Air Make Infuriate Lows are getting more and more popular with outdoor players, and their durable, rigid tread makes for great traction on asphalt. Mesh uppers keep the shoe lightweight and breathable, while Flywire cable technology provides superior fit. Phylon midsoles ensure they are very comfortable with every step. These are also a good choice for outdoor players who want a lightweight low-top shoe. The interesting thing about these shoes is how well-liked they are, and it’s hard to find fault with them. The one thing I could say about these is they run slightly narrow, but compared to other Nike shoes, they’re not even that narrow. The Nike LeBron Soldier X’s are a very solid outdoor shoe choice. They have a diamond shape tread that varies in size from large to small, which lends itself to being a good tread for a variety of surfaces, but especially outdoors when the court surface texture may be on the more varied side. Also, these are shoes that are known for their extreme durability, which another must-have outdoor basketball shoe feature. Perforated foam inside of the upper part of the shoe adds breathability while Zoom Air units provide a responsive, cushioned feel. The LeBron Soldier X Basketball Shoe is known for extreme durability and for a superior level of comfort. In fact, these shoes attract a lot of people who have feet and ankle issues, because their comfort level is that well-known. Also, the Soldier X’s are great for making quick cuts, so they’re worthy of your consideration if your style is fast-paced. I couldn’t find any cons for the LeBron Soldier IX. You also can’t ignore their durability. Definitely my favourite pick. The woven upper on the Nike Jordan CP3.X Basketball Shoes is made out of a single piece of seamless textile for breathability that also feels like it’s tailor-made for your foot. This design choice also keeps the weight of the shoe down. The injected Phylon midsole and Zoom Air technology provide for great cushioning, which protects those joints from constant shocks during ankle breaks. The rubber outsole is designed for ultimate durability and features a foot-mapped pattern on the tread for better traction on the court. The low-profile rubber sole looks sleek and modern, which makes the shoe look great. And the durability and traction level on the sole is hard to miss. Comfort features like Zoom Air and a Phylon midsole increase play time while minimizing fatigue. The breathability and comfort of the uppers is enhanced by the great fit the Flywire cables in the laces provide. The main issue with this shoe is that it runs pretty small, but now that you’re armed with that knowledge, it should be easier to work around it. The herringbone tread pattern on the rubber sole of the Kyrie 2’s provides superior traction on an outdoor basketball court. Furthermore, the tread size is large and the tread doesn’t flex much, which will further lend itself to quality outdoor play, even on a dusty court. Comfort is another major feature on the Kyrie 2’s. With Nike Air in the heel of the shoe, you get great comfort in that area, without sacrificing response time. Nike’s Hyperfuse technology in the uppers maintains support while allowing for breathability; breathability is further enhanced by a mesh tongue and collar. 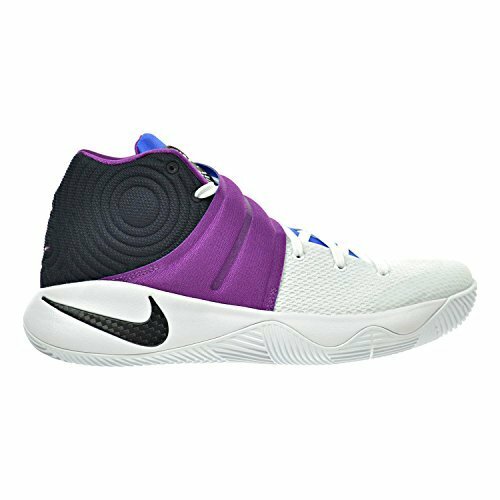 The Kyrie 2’s have laces, but they feature a strap as well, for impressive lockdown and superior control over fit. The herringbone traction and durable rubber sole provide for great outdoor gameplay, which is enhanced by a pivot circle for multidirectional action. The uppers are breathable, so your feet stay cool while you play. The strap at the collar provides excellent lockdown, improving fit. The main complaint with the Kyrie 2’s is that they run both small and narrow, though not everyone finds this to be the case, which confuses matters. Finding a fit won’t be too hard, though, unless your feet run extremely wide. Also, it should be noted that these aren’t the newest Kyries, and they are included because they are still an outdoor favorite as of 2017. The biggest deal about the Jordan Ultra.Fly 2’s is the extreme durability of their solid rubber outsoles, which makes them a great choice for outdoor gameplay, where durability is a must-have feature. These are a great shoe for players who demand both speed and flexibility in their ideal basketball shoe. A big part of this is the Webbing Lace System. You get flexibility and natural movement while still being able to create a snug fit. The uppers are made of lightweight knit, which also adds flexibility, but it brings breathability to the table as well, another feature that makes them a great outdoor choice. The Jordan Ultra.Fly 2’s feature a Nike Zoom Air cushion layer along with a heel-to-toe foam layer for the ultimate in comfortable support. With the solid rubber outsoles that are well-known for their durability, you can’t go wrong using them for outdoor play. The Webbing Lace System is another huge highlight feature that allows for control with flexibility—perfect for players who want both support and a natural feel. Most people agree that these shoes run narrow, so it’s not going to be the best choice for someone with very wide feet. Depending on your foot length and shape, you might be able to go up a size without them being too big and get that extra width you need, but that’s still not an ideal solution for someone with extra wide feet. While you may not immediately see it when you look at the tread pattern, the Kobe Mamba Instincts are actually an outdoor basketball favorite. Where they lack in the size of the tread pattern, they make up for it in rigidity of the pattern and hardness and durability of the rubber outsole. These are a great shoe for someone who likes the feel and movement you get with low-tops, and there are also ideal for someone who wants a lot of comfort in their basketball shoe. The Kobe Mamba Instincts have a Lunarlon midsole that provides superior cushioning to your foot while remaining responsive at the same time, so you don’t have to sacrifice speed for comfort in this case. The durability and rigidity of the tread are great for outdoor gameplay, while the low-top design is going to be great for players who like to keep their ankles free and loose. Lunarlon midsoles cement these as a shoe with a very high level of comfort, yet the material’s springiness means you still get a great response time. People are very divided when it comes to whether or not this shoe runs narrow or not, which makes it harder to predict how they’ll ultimately fit you. That said, the best thing to do is to consider that they most likely run slightly narrow and work from there. While the traction pattern may not be eye-catching at first, its ruggedness and rigidity will serve you well on an outdoor court. The traction pattern is actually inspired by the famed Fibonacci Sequence, which is a geometric shape created using Fibonacci numbers, so if there are any secret math geeks out there, this is a low-key way to let that geek flag fly. The wraparound tongue construction makes for a great lockdown for an ultimate fit, while the toe cap will definitely be an advantage for players who tend to wear out the toe of their shoes first. The Adidas Primeknit construction of the uppers keeps them lightweight and breathable. The unique Fibonacci-inspired tread is an inspiration, and its rigidity handles great on an outdoor court. The reinforced toe cap is going to be ideal for players who wear out the toe quicker than they do the heel. Lightweight cushioning provided by Adidas’s boost technology improves response time tremendously. Aside of the traction, the comfort factor on these is a huge reason they have so many fans. The aesthetic is very minimal, so if that’s not your thing, you may not be into these on first sight. Also, these run slightly narrow, but the narrowness isn’t that extreme, so most will be able to find a fit that works for them. The Performance Men’s D Rose 6 Boost Basketball Shoe is a high-top basketball shoe that has a 5.5-inch shaft from the arch to the top. The midsole cage features ethyl vinyl acetate (EVA) integration. EVA is a high-tech foam that provides protection for your feet and joints while running, which is why it’s a common feature in running shoes. In basketball shoes, EVA in the midsole protects your feet and legs while you sprint during the game, absorbing shock from sudden stops and starts, which prevents not only injury, but fatigue as well. Extensive ventilation in the upper part of the shoe makes these leather shoes surprisingly cool during outdoor gameplay, providing extra comfort. Meanwhile, Adidas’s Boost technology returns impact energy back to you, literally giving you a boost, allowing you to push that much more. While the tread pattern could be more robust for an outdoor shoe, the hard, durable synthetic construction for the outsole makes up for durability where the tread pattern lacks. If you’re looking for an outdoor shoe that could double as an indoor shoe, you can’t beat the outsoles on the Adidas Men’s Performance D Rose 6 shoes, due to the combination of an indoor style tread with an outdoor style hardness and durability factor. The Boost technology and the EVA midsole are big selling points for these shoes. The EVA midsole provides excellent joint protection while fighting fatigue. Meanwhile, the Boost technology aspect’s high-tech energy return allows you to put more back into your game. The Performance D Rose 6’s are also a more versatile shoe, featuring aspects that are good for both outdoor and indoor play, for those looking for a good two-in-one shoe that leans more towards the outdoor play end of things. Another good thing about these shoes is you get a lot of color options to suit your style preferences. These take a while to break in, and like many of the others, run a bit small. If you plan ahead, you can work around this, but it’s still annoying. The Nike KD 8 Mens Basketball Shoes are an exceptional example of Nike stepping up its game in both style and functionality. On the style front, color combos range from dark and moody to bright and fly; they even have colors your girlfriend could rock if she wanted to, making it literally the basketball shoe for everyone. Featuring Nike’s Flywire cable tech for superior lockdown and Flyweave mesh uppers for extra breathability and support, the KD 8’s are certainly a force to be reckoned with on the court—especially when you factor in the articulated Air Zoom support for ultimate control during fast movements. In particular, the Flywire cables in the forefoot are going to give you the extra control you need if you tend to put more weight on your forefoot during gameplay. The biggest pros have to be Nike’s successful combination of Flywire and Flyweave to produce the outdoor shoes that not only feels great on-court, but functions great on-court as well. The Phylon cushioning is ultra-comfortable without weighing down the shoe, and the wide array of colors makes them universally appealing. Also, while the outsole on the shoe is ultra-durable, which is why it’s a favorite among outdoor players, it also has a tread that can allow it to double as an indoor shoe, which is a good feature if you play both outdoors and indoors and need one shoe that can do both things and do them well. The major downside of the Nike KD 8 shoe is that many find it runs really small, potentially in both length and width. That said, the easy fix is to size up in advance; when you do that, the whole running small isn’t really an issue. Ever have trouble making that flawless jump shot? The Zoom L.E.A.P. Technology is designed to help with propulsion, making jump shots and slam dunks a little more attainable for those of us who aren’t Lebron. Nike’s Zoom Air technology is a big feature on these shoes. Made up of internal fibers and pressurized air, Zoom Air technology cushions your feet while springing back ultra-fast; this means that despite the superior cushioning, you won’t be slowed down during sprints across the court. Four of the Zoom Air units are located at the forefoot while the larger Zoom Air units are located at the first metatarsal head (first met head) and heel for extra support and responsiveness. The Zoom Air cushions provide ultimate comfort and live up to the hype of making quick cuts and other fast movements easier; you also feel like you’re closer to the ground below, making it great for outdoor play when you need a feel for potential flaws that wouldn’t be present in an indoor court. I would definitely say the nike men’s lebron xiii is one of the top basketball footwear when it comes to surface awareness and sensitivity. They run narrow, so you have to size up, which can be annoying, so plan ahead and consider whether or not your feet are wide when purchasing, as that might impact which size you ultimately choose. The Nike Men’s LeBron Soldier X Basketball Shoe is easily still one of the best shoes you can buy for outdoor courts. With superior lockdown, great looks and durable, rugged tread, you can’t go wrong with the LeBron Soldier X’s on an outdoor court. Choosing the best footwear for your needs is a combination of choosing a shoe that fits the basic criteria for a basketball shoe and choosing a shoe that works for your playing style. Every basketball player has a different style on the court. Likewise, every player has their strengths and weaknesses. All of these aspects factor into what ultimately makes the best outdoor basketball shoes for your needs. Go for a basketball shoe that features a tough, hard rubber sole. Hard soles stand up to the roughness and lack of uniformity in texture outdoor basketball courts often have, and they also provide you with greater stability. Look at the tread. Outdoor basketball shoes tend to have larger tread patterns, and the tread should not be easily manipulated by hand, which goes back to the hardness of the rubber sole. If you find you skid a lot while playing outdoor hoops, good tread should be a top priority for you. If you have any weakness or previous injuries in your feet, ankles or legs in general, go for a shoe that is supportive and that provides quality shock absorption. For increased stability in the ankle area, and for better balance, go for a high-top shoe. If you prize flexibility of movement when you play, consider a low-top outdoor basketball shoe. While there will be less stability in the ankle area, you’ll get more versatility in your ability to move, which may better benefit your personal playstyle. Breathability is crucial for outdoor basketball shoes because the outdoors is simply hotter than the indoors. Look for shoes with ventilation in the uppers. Outdoor players will often wear out the heel and/or toe of their outsole first. If you wear out one quicker than the other, try going for a shoe that features more durability and a more robust tread in that area, so you get more life out of your shoes. What is the difference between outdoor basketball shoes and indoor basketball shoes? The primary difference between an outdoor basketball shoe and an indoor basketball shoe is the hardness of the rubber sole (also known more specifically as the outsole). The outsole of a good outdoor basketball shoe is going to be harder than an indoor shoe. To test hardness, you can rub your finger firmly against the tread and see how easy the tread bends. There should be very minimal movement—if any—in an outdoor basketball shoe when you run through this test. You can tell an indoor basketball shoe when you feel one because the tread will be easy to move with your finger. This is great for indoor hoops, but for outdoor hoops, a hard sole is always best. Another major difference between outdoor basketball shoes and indoor basketball shoes is the thread size. Patterns can vary a lot, but outdoor basketball shoes are going to have a larger tread pattern, whereas the tread pattern is going to be a lot smaller on an indoor shoe. Outdoor basketball shoes often feature a herringbone tread for this reason; the herringbone pattern maintains great traction when it’s scaled up to a larger size, whereas other tread patterns may not carry over in tread quality or performance so much after they’re enlarged. The tread pattern on an outdoor shoe is also going to be all over the bottom of the shoe, whereas indoor shoes will be more likely to have blank spaces, which can have benefits indoors, depending on your style. Outdoors, however, blank spaces can really hinder your game by causing you to slide all over the court, increasing your chance of an injury. Outdoor basketball shoes tend to feature superior ventilation in the upper part of the shoe compared to indoor shoes. The reason for this is simply because it’s typically hotter outside than it is inside, and the ventilation allows your feet to cool, keeping you comfortable while you play. Because outdoor courts can be slicker than indoor courts (even when it doesn’t visually look that way), a lot of them feature superior support and stability features for your feet and ankles, which helps you stay upright, even when you’re performing tricky maneuvers. A lot of the better outdoor basketball shoes have great cushioning and shock absorption because outdoor surfaces are obviously a lot harder than an indoor wooden court. Think of this feature like an investment in your future. You may not notice the difference now, but you will after you play, whether you wake up with aching knees or shins tomorrow or ten years from now, so it’s really important for your overall health to consider the shock absorption aspect. This is especially important if you’re a young guy who has big dreams of college basketball or playing in the NBA. Avoid injury now to save yourself some heartache in the future. The biggest benefit you get from buying an outdoor basketball shoe is the longevity a harder outsole provides. It’s true that an asphalt court is slicker than an indoor court, but, paradoxically, outdoor courts are less uniform in their texture. Over time, the rougher texture of the court will wear on any shoe. Naturally, harder outsoles stand up to this a lot better and have a longer lifespan when you play on a court outside. As I said, it’s kind of a paradox. On the one hand, outdoor courts are rougher in texture, yet they make you slip. This doesn’t make much sense at first, but you have to consider all of the microsurfaces that make up an asphalt court. While asphalt may be less uniform in texture and wear down your shoes quicker as a result, much of those micro surfaces on the asphalt are way slicker than any indoor court could ever be—especially if the court you play on is typically covered in a layer of dirt or sand due to lack of maintenance or environment issues. All of these factors are what causes increased slickness on an outdoor court. And this is something that’s going to be unavoidable on this court, which brings me to the traction benefits of an outdoor basketball shoe. The tread on an basketball shoes designed to be oustide is going to feature a relatively large pattern size compared to indoor shoes. When you combine that with the hardness of the rubber outsole outdoor shoes have, what you get is a very large, stiff tread. This provides superior traction on outdoor courts and is another top benefit to buying a basketball footwear designed for outside play. Tread, along with outsole hardness, are really the two key features that will give you the biggest boost—and greatest protection—when shooting hoops in the park, backyard etc. Ventilation is another key aspect that is more important when it comes to shoes for outdoor basketball. This types of shoes are going to have not only more ventilation areas but better ventilation areas in the uppers to keep your feet cool while you shoot hoops in the summer heat. The uppers may also be made of mesh or a high-tech material, as opposed to heavier materials like leather, which also provides more breathability while simultaneously keeping the weight of the shoe from being too heavy due to the harder, sturdier outsole. Other benefits of buying outdoor basketball shoes are going to be pretty much the same as standard basketball shoes, but it’s important to keep them in mind if you’re someone who’s just picking up basketball for the first time, because there’s a lot of temptation for beginning players to use their tennis shoes or running shoes to play outside. This is okay if you only play once a month or so. But if you’re going to be shooting hoops more frequently than that, it’d be wise to invest in a good pair of basketball shoes to use outside, because there are general benefits that all basketball shoes have, that are specifically designed to help players in-game and provide protection against basketball-specific injuries. In basketball, you’re going to be sprinting short distances at a very fast pace, instead of running long distances at a moderate to fast pace. All the quick starts and stops mean you need not only traction, but stability, and this is a feature all basketball shoes have, but it’ll be especially important on an outdoor court. This is why the best outdoor basketball shoes are heavier than running shoes. For short sprints, your shoes don’t have to be light. What they need to be able to do is give you the shock absorption you need for fast running, jumps, and other maneuvers, while also providing stability for your ankles and knees to prevent injury.